Folding panel displays are made from lightweight rigid panels that are covered in velcro receptive fabric. 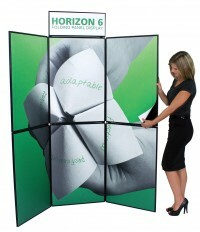 Most displays consist of multiple folding panels of various sizes that can be stacked to form full height displays in different shapes and configurations. Most of the displays come in a variety of fabric colors, and full height displays can be used separately as table top displays. 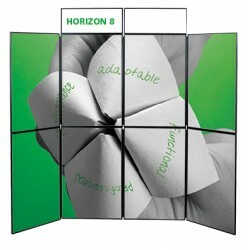 Folding panel displays are typically used for shows and presentations where the customer has graphics that attach with velcro they want to stick anywhere on the surface of the display. While this doesn't have the same visual impact as some other trade show displays, it is a great option for customers with small graphics that change frequently.